3D Printing is now available at the Hammonton Branch! While anyone can use our 3D Printer, there are a few restrictions on 3D Printing. Please read our 3D Printing Procedure. Sketchup - Google has made a very powerful and fairly easy to use 3D modeling program. It may require a plugin to export to .stl. Blender - It is a powerful program contains features that are characteristic of high-end 3D software. AutoDesk123 - They have AutoDesk Design, which is free and powerful. As well as apps for iOS and Android that can turn photos into 3D Models. Once you have your .stl file and are ready to print, simply fill out our 3D request form. 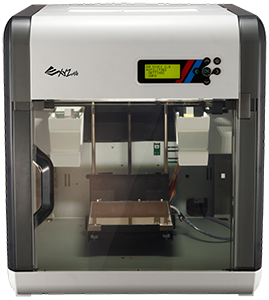 Our 3D Printer is an XYZ da Vinci 2.0 Duo. It has a maximum build size of 5.9H x 7.8W x 7.8D inch (15x20x20cm). The printer has a resolution as fine as 100 microns. It prints using ABS Plastic. (Learn more about plastics used for 3D printing.) Here is a short video showing our Hammonton printer in action. It is printing a replacement dishwasher wheel.